Although collard greens taste lovely raw, preparing them using the chiffonade technique and then gently sauteing them is another good way to enjoy the greens in a stirfry, salad or just by themselves. This is more of a method than a recipe, and the ingredients listed below are simply a suggestion, as the focus of this preparation is all about transforming the collard greens from large, flat leaves into soft, spaghetti-like tendrils. 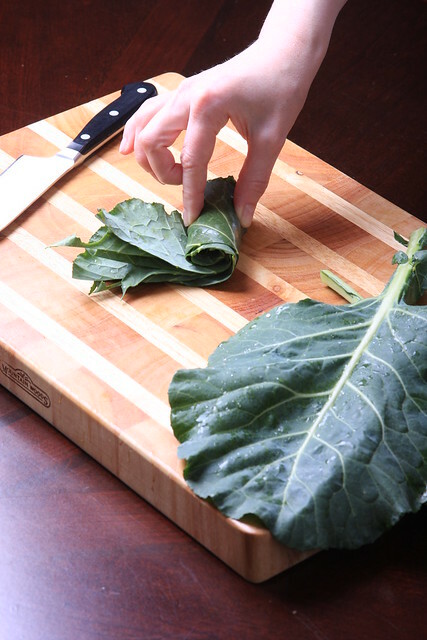 Slice away the tough veins from the center of the collard greens leaves. (I use these veins for making stock later.) Stack 8-10 halves of leaves on top of each other and roll tightly. 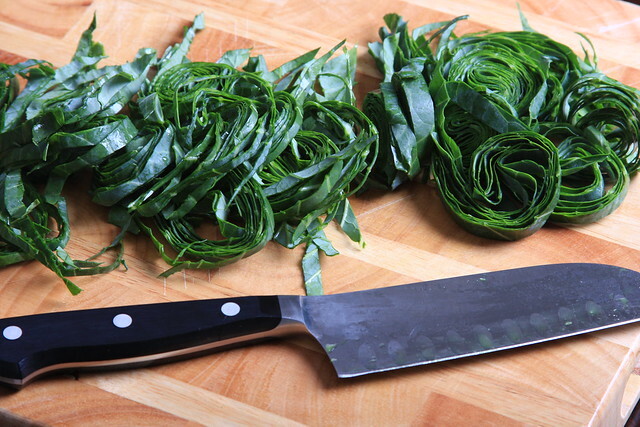 Using a very sharp knife, chop the roll into thin slices to produce spiral-like ribbons. Then wash the sliced collard greens very well under cold water and pat dry. 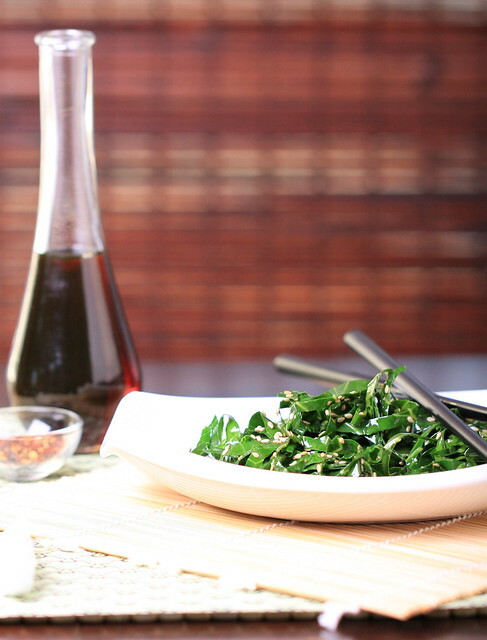 Place the collard greens into a saute pan with a few dashes of sesame oil, soy sauce and sriracha or chili pepper flakes and saute over medium heat for only one to two minutes, stirring continuously. Remove from the heat and sprinkle with sesame seeds. Serve immediately. Glad you enjoyed it, Leila! What a great serving idea! This was such a great recipe! I am not the biggest fan of collard greens, but I keep getting them in my CSA. Thanks for helping me give collard greens a second chance 🙂 I also added some sushi vinegar at the end. Can't wait to try this! At first glance, it strikes me as a local, healthy (sans food dye and sugar) alternative to seaweed salad! I bet it would pair nicely with veggie sushi!